£10 which includes talk and afternoon tea. 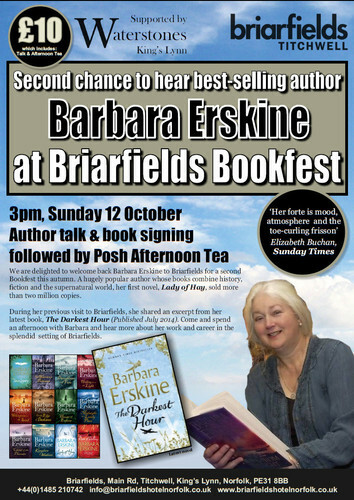 Second chance to hear bestselling author Barbara Erskine at Briarfields Bookfest. Author talk and book signing followed by Posh Afternoon Tea. We are delighted to welcome back Barbara Erskine to Briarfields for a second Bookfest this autumn. A hugely popular author whose books combine history, fiction and the supernatural world, her first novel, Lady of Hay, sold more than 2 million copies. During her previous visit to Briarfields, she shared an excerpt from her latest book, The Darkest Hour published in July 2014. Come and spend an afternoon with Barbara and hear more about her work and career in the splendid setting of Briarfields.